Subsequent posts will convey more about the combat history of the unit during this period of service in New Guinea. In June 1943, the 2/2nd sailed from Townsville to Port Moresby and was subsequently flown to Bena Bena, in the Bismarck Ranges in New Guinea. Here, the 2/2nd supported the 2/7th Independent Company in patrolling the Ramu River area as a component of Bena Force. In mid-July, the 2/2nd moved into positions around Bena Bena and by the end of the month their patrols were skirmishing with the Japanese. They continued to conduct operations in New Guinea until October 1944 when, after being away from Australia for more than a year, the 2/2nd were withdrawn from the fighting for a period of leave in Australia. Prior to the arrival of the 2/2 in the New Guinea Highlands the fierce conflict between Allied and Japanese troops had been fought further east at Milne Bay (August 1942), Kokoda Trail, Gona and Buna (August - December 1942) and Wau-Bulolo (January - February 1943). In each of these battles the Japanese had been thwarted in their attempt to capture Port Moresby. There remained one final plan in their strategy to defeat the Allies - to occupy the Highlands and use them as a base to launch a massive attack on Moresby by way of the Gulf of Papua. Impractical as such an invasion may have been, the occupation of the Highlands was a real possibility. For the Allies the presence of a Japanese army on the plateau would be extremely dangerous and make the ultimate defeat of the enemy very difficult indeed. A problem for the Allies in January 1943 was that they could not spare a large force to guard the Highlands from a Japanese attack. The costly battle for Wau and the consequent follow-up involved many thousands of troops during January and February. When the small Bena Force arrived on 23 January 1943, Lieutenant Rooke set up his headquarters at Hapatoka, in the old ‘haus kiap’ which had been abandoned in October 1941. Defence positions were dug around the 'drome, which had been cleared on an exposed 'hogs-back' formation by the Leahy brothers in 1932. It was now about 1200 yards long and was at that time the only landing ground in the Valley capable of receiving heavily-loaded DC3 (C47) transports. The gutters which defined its position were filled in and grass was burnt in patches to give the impression from the air that it was part of burnt-off garden land. Four observation posts were set up to guard the tracks into the valley, each one in telephone communication with Hapatoka. The Independent Companies were an elite group of fighting soldiers, with special training in commando tactics, sabotage and intelligence. Each man was selected for his sharp mind, physical fitness, resourcefulness. Up to the end of 1943, eight Independent Companies were formed, each comprising from 300 to 400 men. The two companies involved in Bena Force were the 2/7 and the 2/2. The 2/2 had distinguished itself in Portuguese Timor between 1941 and 1943, fighting a lonely but successful guerilla campaign against the Japanese occupying forces. If an enemy invasion of the Highlands did take place these men of the 2/2 and 2/7 Independent Companies were by temperament, training and experience, best fitted to resist such an attack, even though their combined numbers were fewer than 700. The 2/7 was commanded by Major (later Lieutenant-Colonel) T.F.B. McAdie and comprised about 400 soldiers. 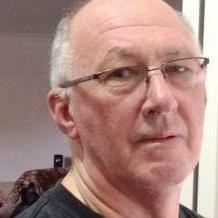 Fergus McAdie was given the same instructions as Rooke, with the addition that "Comd. Bena Force will not, except when attack is imminent or in progress, interfere with the general tasks of ANGAU [Australian New Guinea Administrative Unit] and special detachments." Some friction between Rooke's men and ANGAU had already developed, and this clause was designed to keep the two groups on reasonable terms. The regular soldiers depended on ANGAU to supply native labour and food, and it was therefore in McAdie's interest to achieve a good working relationship. The ANGAU men were mostly pre-war Territorians, with wide experience of the country and its people, and some of the Bena Force troops were given the impression that their presence was not appreciated by the old hands. For their part the soldiers, particularly those in the 2/2 Independent company who had been in Timor and in many cases owed their lives to the Timorese, resented what they regarded as the harsh and overbearing attitude of some ANGAU men to the New Guinea people. S.V. (Mick) Mannix recalls how he "frowned on the way these ANGAU men carried on, shouting and roaring at the natives." He and other Bena Force men relate stories of unfair and condescending treatment meted out by ANGAU personnel to the local people  but they also recognised that the ANGAU men had an unenviable task in having to conscript an unwilling and often frightened labour force, whose work was essential if Bena Force was to achieve its objectives. (i) "We were down the creek at Asaloka washing ourselves and an ANGAU patrol came up with 4 police boys, a couple of carriers and an officer - he had 3 pips on him, and he was shouting and roaring and they carried him across the creek. I thought what a degrading blooming thing that a black man should have to do so much for a white man. Anyway, he got across and saw us and said, 'What's all this going on?' There were five of us down there with our native boys, doing our washing and having a bit of a bath. We were naked and soaping ourselves and he said, 'How dare you take your clothes off in front of the natives". We replied, 'Who do you bloody well think you are?' He blew up and ordered our boys off and went raging up to the house, where our officer 'Bull' told us later, 'If anything like this happens again, just get in the scrub, will you.'" 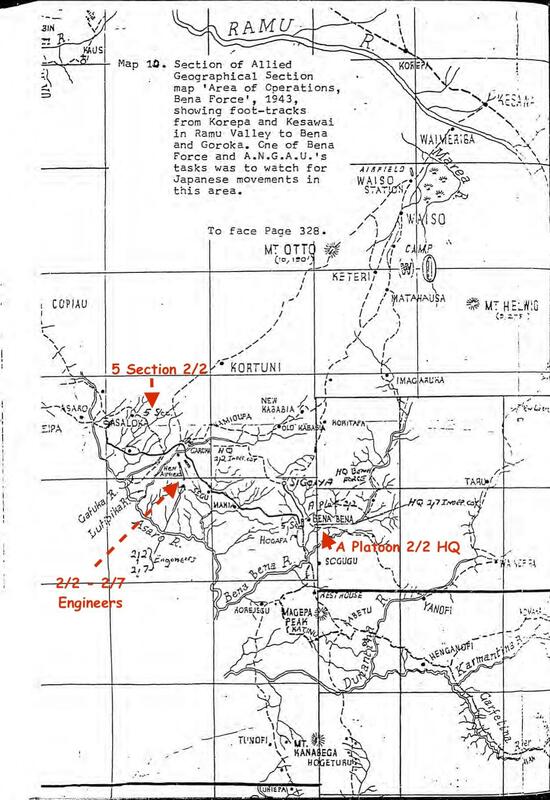 The airlift of the 2/7 into Lena Lena on 29 May was carried out by a 'flight' of 12 Douglas transports (DC3s) and the men "went straight into patrol activity and observation post work on the Ramu side of the mountains." McAdie's strategy was to keep a constant watch on Japanese movements in the Ramu Valley and develop defensive positions on the four tracks by which the Japanese could gain access into the Highlands. To be able to meet a possible attack through any of these mountain passes McAdie needed a motor road linking Kainantu, Bena Bena, Goroka and Asaroka, by which troops and supplies could be moved quickly to the places where the main Japanese thrust was concentrated. Thus, road construction became an important part of Bena Force's activities, and in June the first section was constructed between Bena and Goroka, while the longer stretch between Bena and Kainantu was reconnoitred. Road building, as well as airfield construction, observation post siting, the clearing of tracks, laying of telephone lines, the supply of native foods, digging of trenches and store tunnels, all required the cooperation of ANGAU and the native labour force. Hence McAdie's concern that Bena Force and ANGAU work together harmoniously. By and large this objective was met, and all these tasks were completed on schedule. Two days before work began on the Goroka airstrip the vanguard of another Independent Company, the 2/2, arrived to reinforce the 2/7. The 2/2 had had six months to recover from their guerilla warfare experience in Timor and were in good shape to fight the Japanese. They saw their role as offensive rather than defensive, and to some of the men this holding operation in the Highlands was rather tedious. The opportunity to 'have a go' at the enemy would come in a few weeks, but for the moment they had to be content with guarding the Goroka and Asaroka airstrips and patrolling the country from Goroka west to Chimbu. Their commander was Major Geoff Laidlaw, whose aggressive leadership in Timor had earned from his men the nick name of 'The Bull'. His men had immense admiration for him, and by all accounts he led a very closely-knit, campaign-seasoned team of commandos. Three weeks before the arrival of the 2/2, McAdie had despatched sections of the 2/7 to occupy posts at Goroka and Asaroka, with the task of guarding the small airstrips in each place. With the construction of the new Goroka aerodrome, the defence of the area gained a high priority and it was decided to put the 2/2 in charge of all territory west of Sigoiya. Laidlaw established his Company Headquarters at Humilaveka, and placed troops around the new 'drome and at Asaroka. Goroka had suddenly resumed its pre-war significance as a centre of administration, and from 30 June 1943, the day on which 2/2 Company Headquarters were set up, it continued to increase in importance, until in 1946 it became the civilian administrative headquarters for the whole of the Highlands. The establishment of the new aerodrome was, of course, the key this development. The Americans had given Goroka a landing ground superior to any other throughout the highlands, a facility not to be matched until the new drome at Mount Hagen was opened over two decades later. The first contingent of 10 plane loads of 2/2 troops landed at Bena Bena on 27 June. On 8 July, with the new Goroka aerodrome complete, a second flight of DC3s, escorted by Lightnings, brought 6 officers, 92 other ranks and their stores direct to Goroka. This would have been the occasion of the official opening of the big landing ground, and there must have been considerable satisfaction that a large body of men and supplies could be delivered right to their field of operation. The next day there were no air-raids, although enemy aircraft were heard, and stores were feverishly "scattered to dumps in the area, mainly natives being used as porters." On the 11th it was noted: "Two years ago today, this Coy was brought into being at FOSTER, VICTORIA." The diarist commented dolefully that "owing to the lack of civilization in this area, the occasion was not celebrated in the customary manner." Further detachments of 2/2 Company troops arrived on 24 and 25 July and the last group came in on 1 August. The Diarist reported on that day "The movement of this COY is now complete, except for hospital patients at Moresby. The COY strength in this area is now 20-OFFRS (OFFICERS) 277 0/RS (other Ranks). Dispositions are:- HQ at GAROKA. A PL.H.Q. and No 2 SEC at MATAHAUSA (MADANG 0.4846); No 1 SEC AT HALF-WAY CAMP (MADANG 0.5454). NO 3 SEC AT WESA STATION (MADANG 0.60537). The Signal. Section is split up amongst HQ's and Sections. Engineer Section is on road building activities around BENA BENA area B.1.1 positions are unchanged. C. PL still at GAROKA." The opening of the new Goroka airfield and the deployment of 2/2 troops in ever increasing numbers during July was bound to invite increased Japanese aerial attacks on the Goroka Valley. The Diarist records bombing raids on either Goroka, Asaroka or Bena Bena on 3, 8, 13, 20, 24 and 30 July. The most serious of these were the attack on the new Goroka airfield on 3 July, when one native was killed and two injured (although their identity is not given, Goroka informants recall that they were Chimbu labourers, not local villagers) on the 20th, when a majority of the huts at Bena Bena were burned out, on the 24th, when the old Goroka airstrip was hit by 2 H.E. (high explosive) and 4 A.P. (antipersonnel) bombs and on the 30th, when 6 bombers and 19 fighters bombed and strafed the Goroka area dropping five 500 lb bombs and 13 A.P bombs. Four of the H.E. bombs scored direct hits on the new airstrip, but the Diarist was able to record that "no damage or casualties resulted, and the drome was still serviceable." At the same time as these enemy raids were being endured the Diarist was noting-with increased frequency the presence in the skies of large numbers of Allied aircraft, presumably on their way north to bomb Japanese positions around Madang and Wewak. By the end of July, the Allies had aerial supremacy over the Highlands, and the Japanese bombing raid on Goroka on the 30th was in fact the last they were able to undertake. The climax of the Allied aerial offensive came on 17 August, when no' less than 275 enemy planes were destroyed in the vicinity of Wewak. The 2/2 Company Diarist recorded: "The enemy had been gathering this force of planes for a major land and air push in N.G. as we are in the immediate neighbourhood, the result was especially gratifying to this Coy." This devastating blow to Japanese air power meant that Bena Force's task of defending the Highland airstrips from aerial, attack or invasion, was virtually complete, and the 2/7 and 2/2 Independent Companies could now concentrate all their efforts on fighting the enemy on the ground. This required engaging the Japanese along the middle Ramu River Valley, in all that country north of the forward patrol positions perched on the ridges of the Ramu Fall. 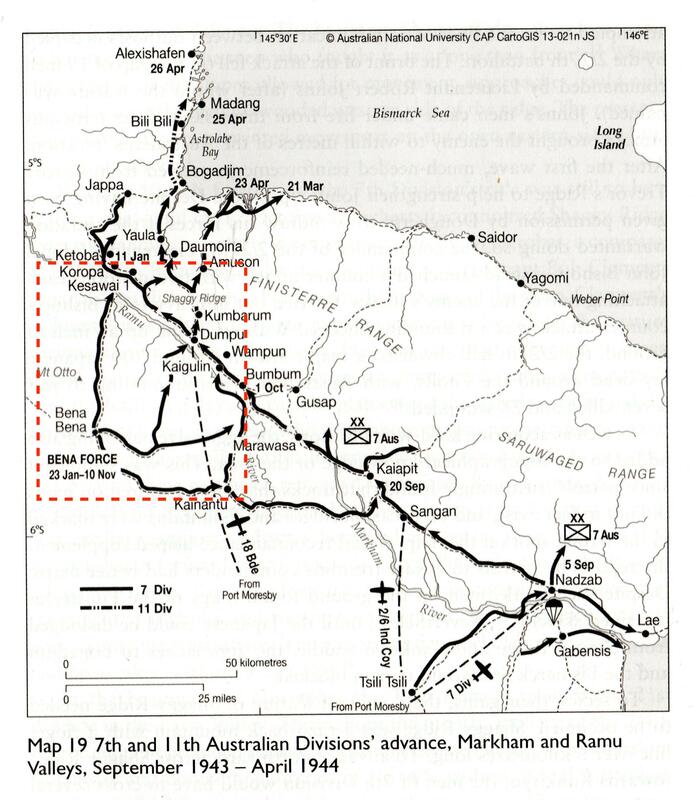 These engagements are covered in detail by David Dexter in his ‘The New Guinea Offensives’, and are somewhat outside the scope of this study, except insofar as the troops were supplied from Goroka and Bena Bena throughout the period July to November 1943, and Force Headquarters remained at Sigoya until it was closed down on 10 November. However, their role was now a passive one, and apart from minimal interaction with the Goroka people who were their immediate neighbours around the rest camp and the big aerodrome they ceased to have a significant impact on the inhabitants of the Goroka Valley. Peter M. Munster. 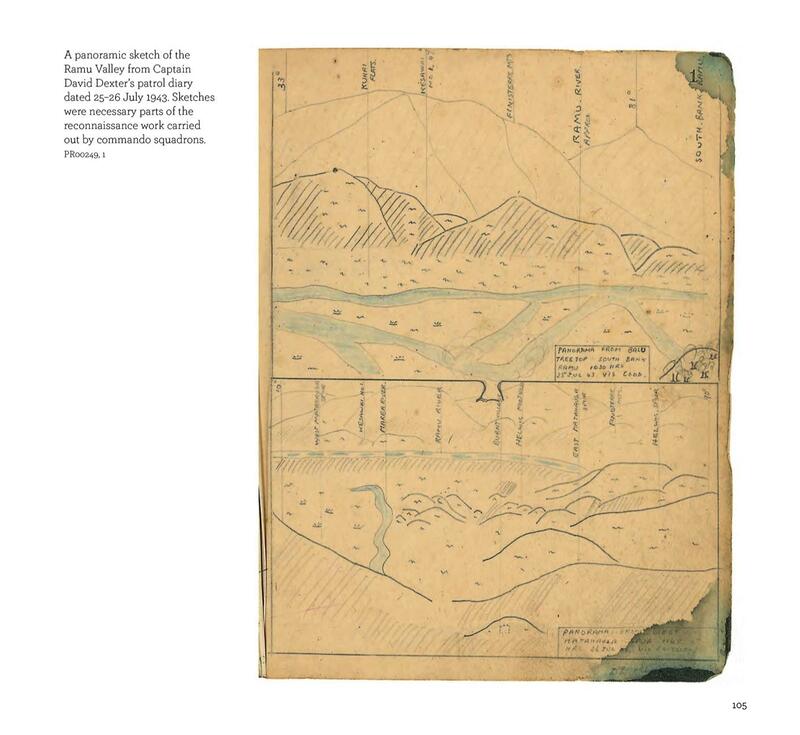 History of contact and change in the Goroka Valley, Central Highlands of New Guinea, 1934-1949. Deakin University. School of Social Sciences. Thesis (Ph.D.)--Deakin University, Victoria, 1986. http://dro.deakin.edu.au/view/DU:30023415; esp. Ch. 7. Most of the text in this post is derived from Peter Munster's thesis. I have added some text, headings, maps, references and photos to improve the relevance and clarity of the text for this readership. The depth and quality of Dr. Munster's research is excellent and the 2/2 get a very sympathetic and well-informed account of their involvement in this campaign. Mark Johnston and Australia, Department of Veterans' Affairs. 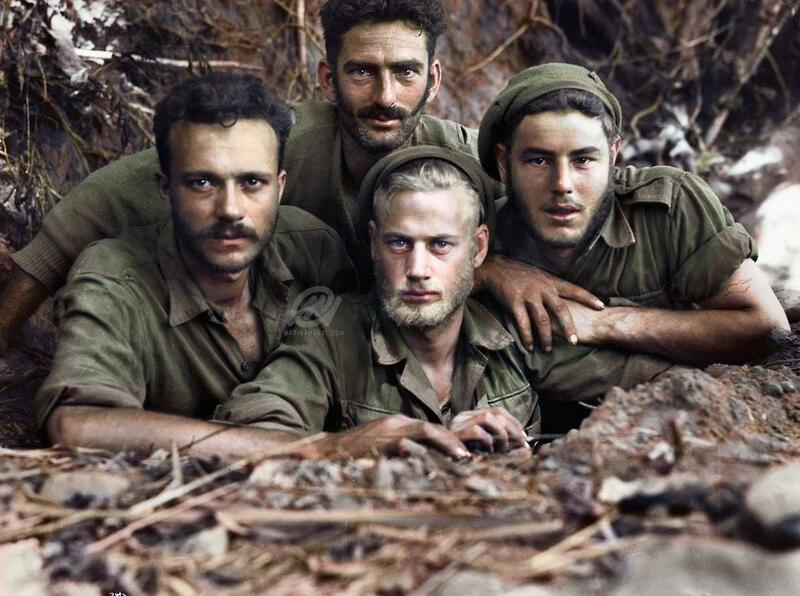 The Markham and Ramu Valleys 1943-1944: Australians in the Pacific War. - Dept. of Veteran's Affairs Canberra 2005: iv. Lachlan Grant ‘Operations in the Markham and Ramu Valleys’ in Australia 1943: the liberation of New Guinea / edited by Peter J. Dean Cambridge University Press Cambridge ; Port Melbourne, Vic 2014: 243. A document found in a crashed Japanese plane at Tsili Tsili on 13 December 1942 revealed plans for a Japanese attack on the Kainantu, Bena Bena and Chimbu areas to be carried out in September - October 1943. Three infantry battalions were to be involved, with air support and the possible use of paratroops. (Undated secret communication to 2/2 Australian Independent Company, c.August 1943, filed with 2/2 Indep. Co. War Diary, Bena Force File 1/5/42, Aug - Nov 1943, Australian War Memorial Archives, Canberra). David Dexter. 1961. The New Guinea Offensives (Australia in the War of 1939 - 1945, Series One, Army, Vol VI). Canberra: Australian War Memorial, pp 234-5. It is not clear if these operational instructions were drawn up as early as January, 1943. They may have been developed as a result of Rooke's own experiences between January and May. They first appear in Bena Force and ANGAU documents in late May, when the 2/7 Australian Independent Company arrived in strength under the command of Major (later Lieut-Colonel) T.F.B. McAdie. Bernard C. Callinan. 1953. Independent Company - The 2/2 and 2/4 Australian Independent Companies in Portuguese Timor, 1941 - 1943. Melbourne: Heinemann, pp xiii - xv. Dexter gives an approximate figure of "about 400 strong" in ‘The New Guinea Offensives’, p 238. The ANGAU Secret Administrative Instruction 28 May 1943, advised: "The 2/7th Independent Coy, strength all ranks 289, together with AASC Det (Signals ) strength all ranks 4, move by air to Bena Bena on 29 May." It is possible Dexter added Rooke's group to this number, giving a total of 351. (Administrative Instruction filed with ANGAU War Diary, loc. cit. ANGAU War Diary, 28 May 1943. 'Mick" Mannix, interviewed 18 February 1976. Don Latimer, former member of 2/7 Australian Independent Company, interviewed at Sydney, 17 February 1976. Karl James and Australian War Memorial, issuing body. Double diamonds: Australian commandos in the Pacific war 1941-45. NewSouth Publishing Sydney, NSW, 2016: 105. Harry Botterill, interviewed at Highett, Victoria, 13.1.76. C.D. Doig. The history of the Second Independent Company. C. Doig [Perth, W.A.] 1986: 188. Other raids did occur, such as the fighter attack on 10 November, when Bena, Sigoiya and Goroka were strafed (Dexter: 599). However, there is no record of further bombing attacks. This figure does seem somewhat excessive, considering the tasks the Americans had to perform. A few engineers would have remained at Goroka, plus a small detachment in charge of the anti-aircraft positions. The two radar stations close to Goroka and Bena Bena may have required larger units, and there may have been Americans at other centres, such as Kainantu, Chimbu and Mount Hagen. There was a US Air Force Rest Centre at Mount Hagen in 1944-45. Closing Report, War Diary, 9 Nov 1943. Bena Force File 1/5/42, August - November 1943. Australian War Memorial) Canberra. 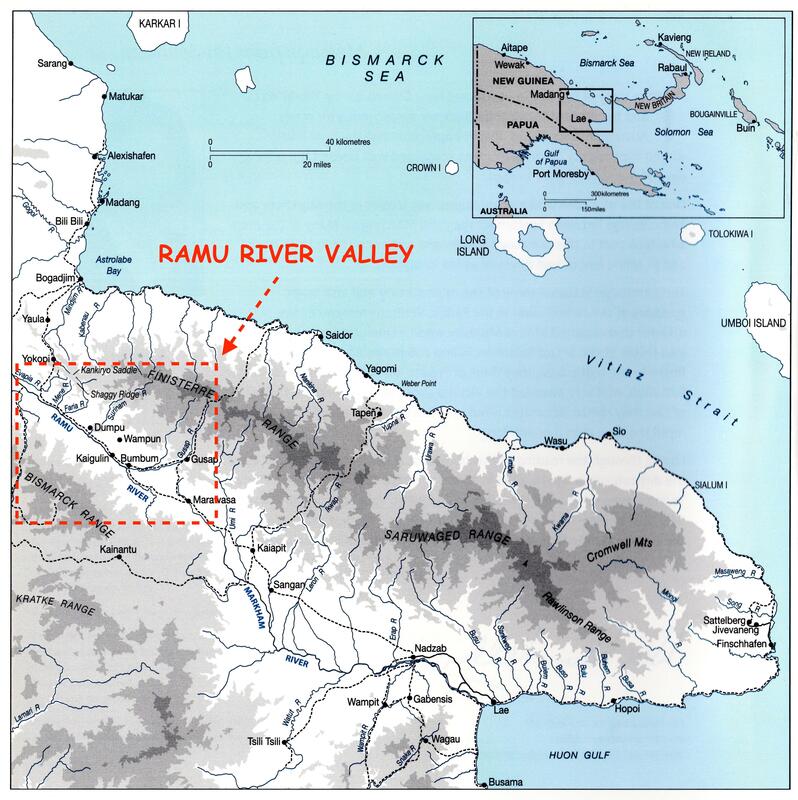 McAdie's reference -to 'the upper Ramu' valley is confusing, as Upper Ramu was the pre-war name for Kainantu, and is still used to denote the Highlands section of the river above the Yonki Dam and Power Station. What McAdie refers toss the upper Ramu is more correctly described as the middle Ramu Valley. Dexter, op cit., p 600. Confidential report, LHQ tactical school, David St Alban Dexter service record, National Archives of Australia B883, VX38890. 2/2nd Independent Company war diary, 29 September 1943, AWM: AWM52 25/3/2/11) 063287. Source: James Double Diamonds p.103. Thanks for this piece. More kudos to the 2/2, and context to this part of the Pacific War.